I'm Here. I'm Queer. What the Hell do I read? 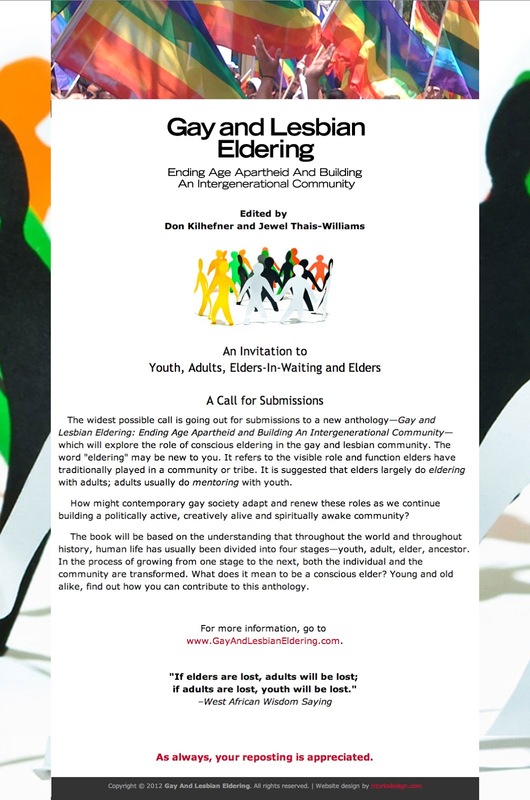 : A Call For Submissions for a new book on Building an Intergenerational LGBTQ Community! A Call For Submissions for a new book on Building an Intergenerational LGBTQ Community! 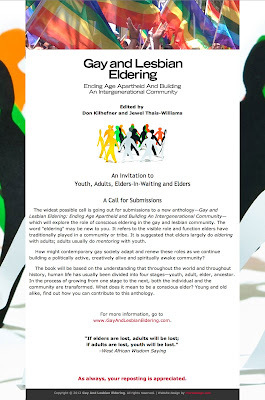 One of my mentors, Dr. Don Kilhefner, is teaming up with Jewel Thais-Williams on a new project, editing "Gay and Lesbian Eldering: Ending Age Apartheid And Building An Intergenerational Community"
They've issued "An Invitation to Youths, Adults, Elders-In-Waiting and Elders"
The widest possible call is going out for submissions to a new anthology - Gay and Lesbian Eldering: Ending Age Apartheid and Building An Intergenerational Community - which will explore the role of conscious eldering in the gay and lesbian community. The word "eldering" may be new to you. It refers to the visible role and function elders have traditionally played in a community or tribe. It is suggested that elders largely do eldering with adults; adults usually do mentoring with youth. How might contemporary gay society adapt and renew these roles as we continue building a politically active, creatively alive and spiritually awake community? The book will be based on the understanding that throughout the world and throughout history, human life has usually been divided into four stages - youth, adult, elder, ancestor. In the process of growing from one stage to the next, both the individual and the community are transformed. What does it mean to be a conscious elder? Young and old alike, find out how you can contribute to this anthology. if adults are lost, youth will be lost." It sounds like a great project and a wonderful opportunity!